List of identified bugs in XMapTools (red, active and green, fixed) and solutions (blue). 024 – Dec. 04, 2018 – The file standard.txt is not properly read by XMapTools if a line of the third block of data has a tabulation and an empty space at the end. Fixed in XMapTools 2.6.1 on Dec. 18, 2018. Thanks to Laure Laffont for discovering and reporting this error. 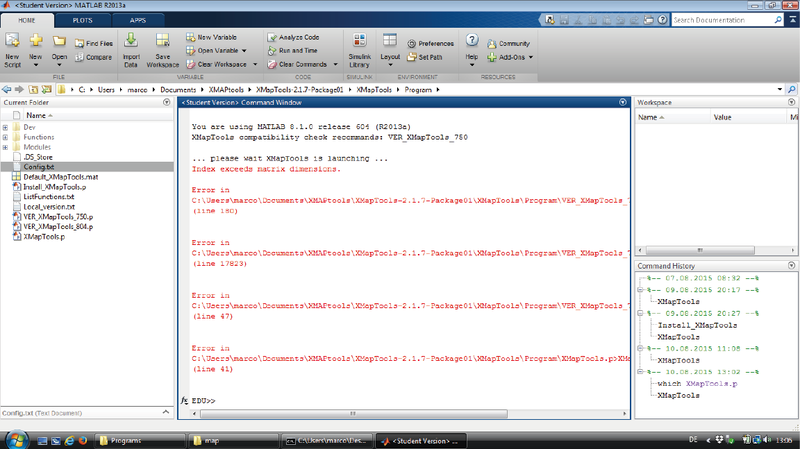 021 – Sep 19, 2017 – Several functions such as sampling line or export oxide compositions are not working for the users having MATLAB 2013b and previous versions. Fixed in XMapTools 2.4.2 released on Sep. 20, 2017. Thanks to Francesco Giuntoli for reporting this error. 020 – May 14, 2017 – The function “transfer to quanti” cannot be used to transfer only part of the maps. If only n maps are selected, the first n maps in the list will be transferred instead with the wrong names. Select all the maps and the function will work ok with the correct names. Fixed in XMapTools 2.4.1. Thanks to Laura Airaghi for reporting this error. 019 – Nov. 11, 2016 – The external function ThermoFctChlBourdelle.m has an error. Fixed in XMapTools 2.4.1. Thanks to Janet Muhling for reporting this error. 018 – July 11, 2016 – The external function StructFctGarnetFe3.m has an error line 149. Fixed in XMapTools 2.3.1. Thanks to Marco Burn for reporting this error. 016 – March 4, 2016 – The function generate a density map (from selected mask file) requires the use of the file Classification.txt (see user guide page 56). If the button “no” or “cancel” is pressed XMapTools stops working and generates an error message. Fixed in XMapTools 2.3.1. Thanks to Gaétan Link for reporting this error. 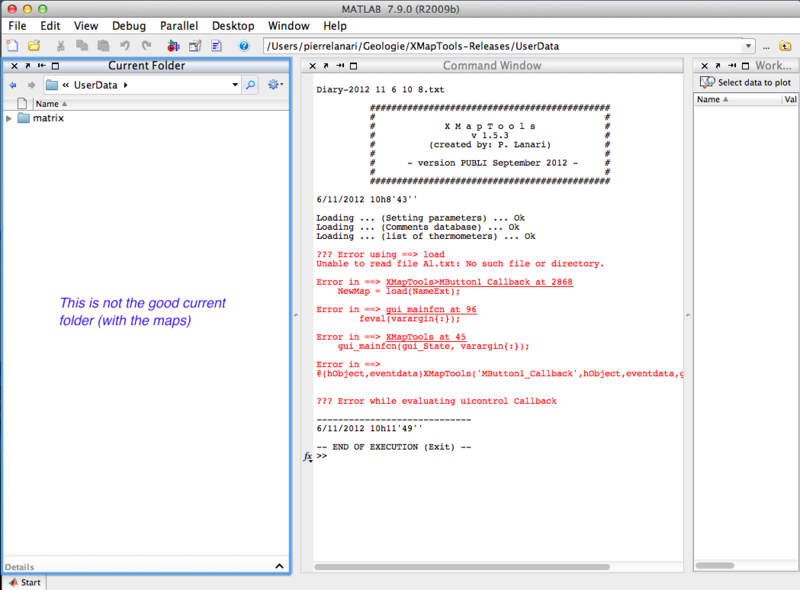 015 – August 17, 2015 – The diary functionality does not work with XMapTools 2.1.7. Fixed in XMapTools 2.2.1. Thanks to Nils Bigge for reporting this error. 014 – August 14, 2015 – Chem2D module is not working with MALTAB 2015a. An error occurs after pressing the button Chem2D and the GUI does not start. Fixed in XMapTools 2.2.1 Thanks to Nils Bigge for reporting this error. Fixed in XMapTools 2.2.1. Thanks to Marco Burn for reporting this error. 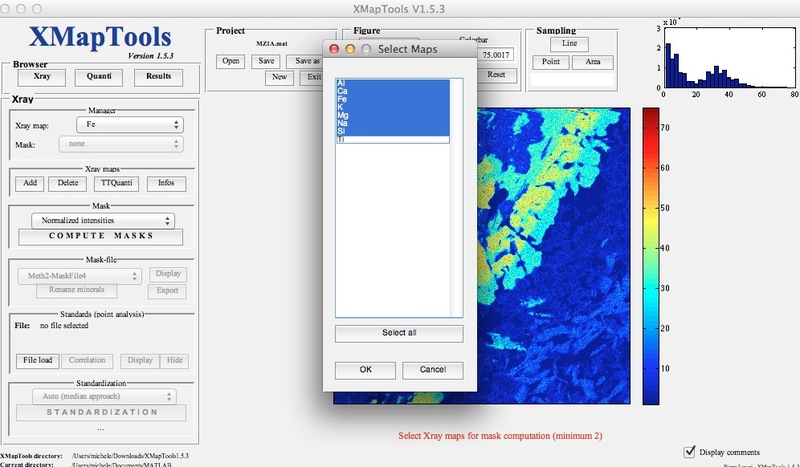 011 – November 18, 2013 – The download of the XMapTools package using the launcher doesn’t work properly from some universities using a proxy. In this special case the connection to our ftp server seems to be not allowed. We know this problem since many month and the only way to solve it is to provide an alternative way for downloading the package. Fixed in XMapTools 1.6.5.